The final day of Division B FIBA Europe tournaments are not as tension packed as in Division A. In this division the prize of promotion is won on the semi-final day. Hungary's first season in Division B has ended with them taking the trophy home. They beat the Slovak Republic in a scrappy game (55-44) that went back and forth for 27 minutes. Amadea Szamosi with her third double-double of the tournament was once again the match winner for Hungary with 18 points, 15 rebounds and 5 steals. Hungary had to wait until late in the third quarter to finally stamp their authority on the game. Diána Miháczi put Hungary in the lead for good with 25 minutes played (32-31). They then made sure that Barbora Bálintová from Slovakia did not get a chance to score again. Bálintová had scored 16 of her team's 31 points. Szamosi was the catalyst as Hungary scored 7 more points to go into the final quarter with the first lead of any significance (39-31). Without Bálintová scoring Nikola Dudásová was unable to bring Slovakia close enough to worry their opponents and Hungary then paced themselves to victory. Bálintová ended her 15-minute barren spell with a trey with 10 seconds left to play to finish the game as top scorer with 19 points. Miháczi and Fanni Szabó also finished in double digits with 12 and 11 points each for Hungary. Portugal bounced back from the disappointment in missing promotion by beating England (78-52) to win the bronze medal. The game went back and fourth for 30 minutes with Portugal leading (51-46) going into the final quarter. England suffered physically during the last quarter while Portugal went on runs of 14-0 and 13-0 to seal the victory. Mafalda Barros fired in 25 points for Portugal, with 21 points coming from three-pointers. Shequila Joseph from England also scored 25 points. A full classification programme was played on the final day with matches being played in the two venues. Luxembourg finished the tournament on a high by beating Switzerland for their only victory of the competition. This result changed nothing in terms of ranking as Luxembourg finished in last place (16th) and Switzerland in 15th. 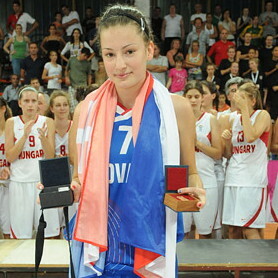 Angelika Slamová from the Slovak Republic is the MVP (Most Valuable Player) of the U16 European Championship Women Division B in Skopje. This is her second U16 Championship and she was first in field goal percentage with 52.1 %. She averaged 15.9 points per game and led her side in assists. Slamová is joined in the all-tournament team by Barbora Bálintová, also from Slovakia, Fanni Szabó from Hungary, Ines Viana from Portugal and Amadea Szamosi from Hungary. The fair-play award went to Eve Emaru from England.